Over the past year or so I have been involved in on going discussions related to referring fault levels from the secondary of a transformer to the primary side. While this is easy for some people to grasp, for others it's not so straight forward. Here is a brief explanation of how to do this. 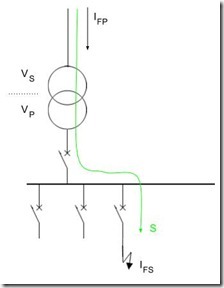 The image shows a simple electrical system around a transformer (primary voltage VP, secondary VS). A fault, IFS (shown on the secondary), will also been seen on the primary side of the transformer IFP. Because, the voltage level on the primary of the transformer is different than the secondary, the two values of current will be different. That really all there is to it. If you wanted to refer from the primary to the secondary, just reverse the ratio of the voltages. 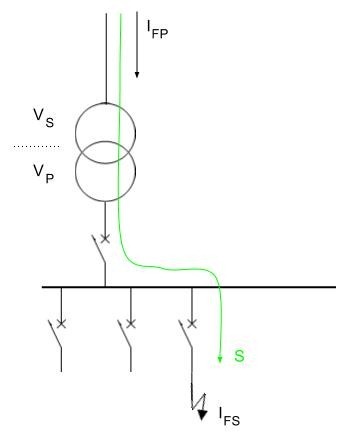 To verify that the above is true, consider the power (S) transfer from the primary to the secondary of the transformer; shown by the green line. The power is the flow of energy into the fault and the 'law of conservation of energy' states that the energy entering the system must be the same as that exiting the system. Ignoring losses (which are small compared to the fault), the power (energy) into the fault must be supplied by via the primary of the transformer and is the same on both sides of the transformer. For a three phase system (with a symmetrical three phase fault), we have the same result. The power would be three times that of a single phase system, with voltages as line to neutral. The three on both sides of the equation cancel, leaving the same answer. For three phase systems, unbalanced or earth faults are more problematic. In these instance it is better to use techniques such as symmetrical components to calculate what is happening. Any other tips or insights, please add to the comments below. If I have a Ynd1 transformer and a phase to phase fault exists on the secondary side am I correct to assume that the fault current at the primary side can be represented as a 3 phase fault with a ratio of Vs/2Vp ? The above applies to balanced faults. With an unbalanced fault such as yours, the primary currents will also be unbalanced. Thanks for the feedback. Regarding primary currents in unbalanced situations I am trying to understand distribution of fault currents through transformers. If I have a wye grounded - delta transformer with a phase to earth fault on the secondary side, am I correct to assume that the primary fault currents on the wye side will be 0 through each of the lines? Furthermore, if the delta side (of the wye groudned delta transformer) is grounded through a zig-zag transformer will the primary currents still be 0?